An award-winning project using archaeology to aid the recovery of solders from The Rifles injured on Operation Herrick continues its success on Salisbury Plain. ‘Operation Nightingale’ has this week received a special award from the British Archaeological Awards in recognition of its innovative use of archaeological work to boost the recovery and career prospects of military personnel injured in Afghanistan. This unique, and hugely successful, programme continues with investigations into the Bronze Age and Anglo-Saxon deposits at Barrow Clump. Soldiers are excavating material, including Saxon grave goods, moved by badgers that have constructed their setts on the prehistoric monument. 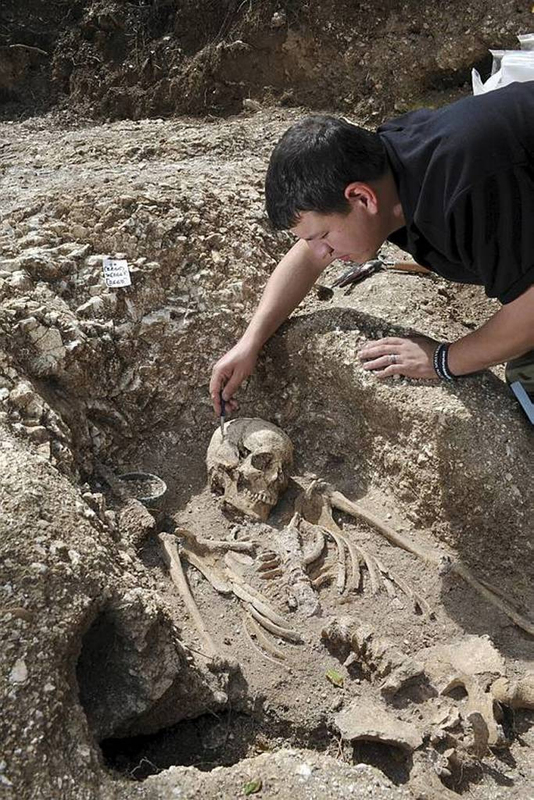 The solders have helped uncover the remains of a sixth century Anglo-Saxon female. ‘Davina’, as they have named the woman is believed to have died in her late teens to early 20s. She appears to have been a person of note, as she was buried in what would have been a prestigious burial site. They have also found the remains of an Anglo-Saxon male, buried with a bronze shield. The Defence Infrastructure Organisation (DIO) worked with the Rifles to create the Rifles to create this opportunity for the soldiers to learn a series of excavation, land survey, drawing and mapping techniques and also enhancing their publication and presentation skills. Eight soldiers are moving on to study archaeology at Leicester University, thanks to the programme. Diarmaid Walshe, of 1 Rifles (Also regular HeritageDaily contributor), said that the project draws in assistance from partners including English Heritage, Wessex Archaeology and the Army’s survey unit, 135 Geographical Squadron, to help deliver the programme. “DIO’s priority is to support our Armed Forces. There are long-standing connections between the profession of archaeology and the military. This work continues to draw on a number of important skill-sets to give the soldiers an enduring interest in heritage and their environment. “We are delighted to receive recognition from the BAA for the project, which underlines its significance, as soldiers who took part in the first dig last September prepare for life after the Services – looking forward to studying archaeology at university. The soldiers themselves with the support of the archaeological professionals involved will not only carry out the excavation but will then produce a published report to record their findings at the site. “These soldiers have all endured a lot during operational tours. Due to complex nature of the injuries that are being experienced in Afghanistan the Army is looking at new and innovative ways to promote recovery. The BAA award means as much to the soldiers participating in the project, as it does to those of us leading the work. The work is crucial to recover important artefacts and human remains before the site is destroyed by burrowing animals, and to assist in the process of addressing Heritage at Risk on the MOD Estate. Members of the project team collected the award – created especially to recognise Operation Nightingale’s strengths – at the prestigious British Archaeological Awards ceremony at the British Museum, in London, on Monday. Soldiers who took part in the initial phase of Operation Nightingale on SPTA last September are now set to use the experience to further their interest in archaeology. “I have worked on all of the Operation Nightingale excavations since the beginning of the project last year and have really enjoyed it. I have excavated on Prehistoric, Roman, 20th Century and now Anglo-Saxon sites all of which have offered really different experiences. Staff at the University of Leicester have now forged close links and good working relationships with both project leaders and soldiers on the programme. “Since we heard about this great project last November we have been keen to be involved at all levels, from working with injured soldiers on Operation Nightingale excavations, to helping those among them who develop a taste for archaeology to take further steps in their future career development through our degree-level courses. We are delighted to welcome the soldiers of Operation Nightingale into our student cohort, as the University of Leicester takes great pride in the accessibility of our teaching and support of students from non-conventional academic backgrounds. 1. Defence Infrastructure Organisation (DIO) is part of the Ministry of Defence (MOD). It is responsible for managing and maintaining land and properties to meet the current and future needs of the MOD and personnel at home and abroad, and to support current operations. 2. Our work includes providing, supporting and improving: operational units; single living and service family accommodation; training areas and historic military sites. DIO actively manages these to ensure the needs of Defence are met, value for money is achieved, our heritage is protected and to achieve our environmental goals. 3. DIO was formed on 1 April 2011 when the former Defence Estates (DE) organisation was brought together with other property and infrastructure functions within department to form a single organisation. DIO manages the MOD’s property infrastructure and ensures strategic management of the Defence estate as a whole.